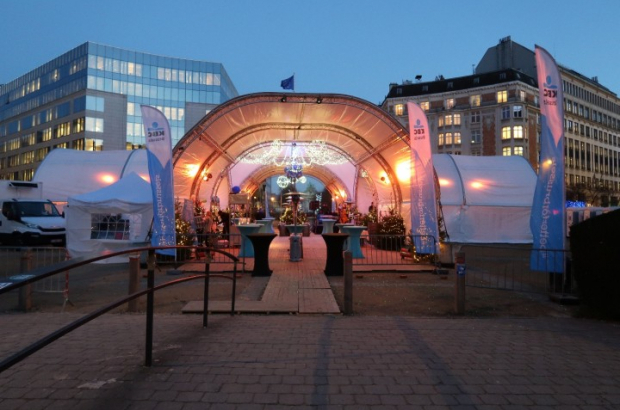 The normally un-village-like EU district of Brussels is taking on a festive atmosphere, with a winter neighbourhood party centred around the Schuman roundabout. Under a white marquee surrounded by 40 lit-up Christmas trees and outdoor heaters, Schuman Lights Up is offering a diverse programme of free activities ranging from a regional produce market to chess and dance. Marion Wolfers, president of local association Schuman Square, said the aim is "to bring life and lights to the Schuman roundabout, the beautiful space at the foot of the three main EU buildings". She added: "We will transform the roundabout into a magical place - the place to be in Brussels' EU quarter." The inauguration on Thursday (29 November) has been jointly organised by the City of Brussels and the Scottish Government Office in Brussels, who invite locals to take part in a ceilidh with live music and food from 17.30 to 22.00. On 1 December, the middle of Schuman roundabout becomes a giant chessboard as Brussels Chess Club puts on a free tournament (14.00-17.00). Then, on 3 December, the Africa-Europe Alliance presents African dance, music and food from 18.00 to 23.00. On 4 December (from 18.00), the European Jewish Community Centre and the European Jewish Association will celebrate the holiday of Chanukah - the festival of lights - with a live concert by French singer David Hababou. The Menorah will remain in place until the holiday ends on 10 December, "to share the light across the heart of the European Union". Chefs and artisans from the neighbourhood will be showcasing their creations on 5 December (17.30-22.00) with musical entertainment in collaboration with Klarafestival. Specialties and seasonal delicacies from the EU's regions will be on sale on 6 December (17.30-21.30), plus there's an introduction to salsa (7 December 18.00-23.00) and a closing ball on the evening on 8 December. Throughout the festival, an exhition curated by Visit Brussels entitled "Europeanness: Am I European?" presents works from 60 artists.